In many European cities, heating and cooling are responsible for a significant share of local energy consumption and GHG emissions. In this context, District Heating and Cooling (DHC) technologies emerge as an option to provide local, affordable and low-carbon energy. While district heating and cooling represent a great opportunity to accelerate the decarbonisation of the local energy system, effective implementation requires appropriate policies and investment. 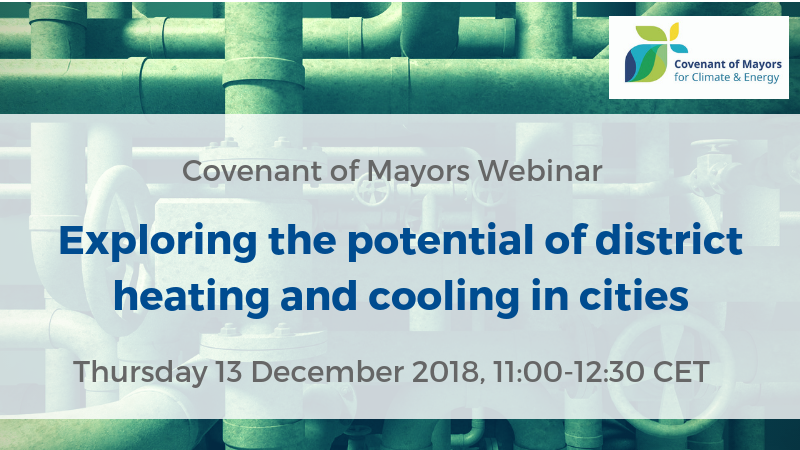 This webinar aims to provide an overview of the potential of district heating and cooling in Europe to reduce local GHG emissions. In addition, it aims to highlight the opportunities that cities have to drive low carbon energy transitions by using local fuel or heat sources that would otherwise be wasted, such as waste heat from industry, heat from waste and wastewater treatment facilities, etc. Several European cities that are signatories of the Covenant of Mayors will share details of how they included district energy options in their local sustainable energy and climate action planning processes. An extensive Q&A session will allow for ample time for your questions.